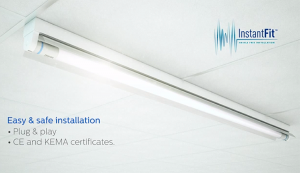 Philips introduce the world’s first LED replacement for fluorescent tubes that requires no rewiring. Royal Philips have just introduced a new instant fit LED replacement tube intended to greatly reduces the cost of replacing existing fluorescent tube lighting compared to other energy efficient LED technology alternatives. The commercial sector has for a long time been better than the residential sector at both reducing cost, and energy use, by dropping incandescent for fluorescent lighting. However, lighting a commercial building like a factory or a large store still requires vast quantities of power, and changing from fluorescent lighting to a LED based solution has until now required a large investment that will take a long time to recoup. For just this reason Philips has developed a new InstantFit LED lamp that fits in to existing lighting fixtures, and that requires no rewiring. LED tube lamps use up to 50 percent less energy compared with common linear fluorescent tube lighting and also require less maintenance due to their long lifetime. Changing from classic linear fluorescent tube lighting to Philips new LED based solution comes with many benefits where it’s energy saving potential is just one part. No mercury in the lamps, non-hazardous disposal. The tubes are glass-free, which is safer for workers. Fast to retrofit in existing locations. A lot of companies today want to be, or at least appear to be, environmentally friendly in the public eye, but in the end all things come down to costs. With Philips InstantFit LED lighting solution it does not really matter if the thought goes to the environment or not. The yearly benefit of the energy saved, equals to a greatly reduced yearly cost for a company. Since this new ‘click-to-fit’ LED alternative from Philips can be used in existing lighting fixtures, the investments to do the switch is kept to a bare minimum, and it can also be implemented quickly. This makes this new InstantFit LED lamp very interesting proposition. Philips estimates that the global install base for fluorescent tube lighting today amounts to approximately 12 billion lamp sockets. Linear fluorescent tube lighting is one of the most common types of general lighting used in supermarkets, offices and industrial spaces today. Philips InstantFit LED replacement tube will be available in the first quarter of 2014, but no exact date has been announced yet. Please visit http://www.philips.com/tled for more information.